ON TOP OF YOUR GAME! 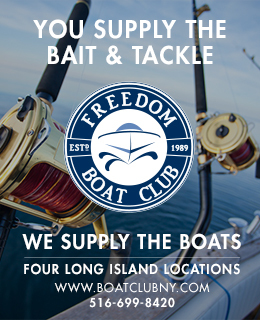 Your Single Source For Long Island's Best Fishing, Hunting and Outdoors Fun! Keeping quiet, going light and working brush or shadow lines are just a couple of ways to tilt the odds in your favor when in pursuit of bright day bass. Outdoortom.com photo. Several consecutive days of bright sunny skies can be a bass angler’s nightmare. In fact, if you’ve been bassin’ for any length of time, you’d probably rather see an approaching storm on the weather map than yellow, smiley sun faces – at least that way you can justify staying home due to inclement weather. But bright, sunny skies and high-pressure systems are inclement weather from a bassin’ standpoint. This combination often sends bucketmouths scurrying for deep water with their jaws locked tighter than a politician under oath – and the longer the sun shines bright, the worse the fishing tends to get. Oh, sure, bright sunshine helps in early spring, but mid-summer fishing on a cloudless day can be quite frustrating. What can you do to improve your odds when the weather gods send the type of skies for which beach-goers pray? There are several options. Use a small weight to help get a worm far from the boat and quickly to the bottom in deep water, then crawl it back as slowly as you can stand. Photo by Tom Schlichter. 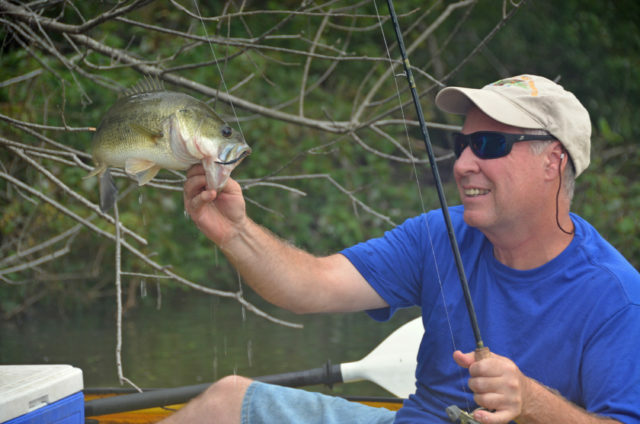 Small lures can pull some pretty nice bass on bright summer days. This chunky bigmouth fell for a tiny Yo-Zuri Alie Goby. Photo by Tom Schlichter. First of all, lighten’ up. Go to light lines and smaller lures in an attempt to offset the better visibility that bass have when the sun seems intense. Bright sunshine cuts deep through the water, reflecting off anything it strikes. Thus, your line is highlighted, swivels flash, knots stand out and hooks sparkle or glimmer. Thinner line is less obvious than thicker line, and fluorocarbon lines absorb or refract light instead of reflecting it, making them nearly invisible in the water. Try stepping down from 10- and 12-pound test to 4- or 6-pound test – or switch over to fluorocarbon if you will be working in gin-clear water. At the very least, add a 3- to 5-foot length of fluorocarbon leader material. In addition to switching lines, eliminate all terminal tackle except for hooks and lures. Tie directly to the main line or leader, sans swivels, snaps, floats, sinkers, etc. This should reduce the number of warning bells and whistles bass will see around your offerings. Next, step down in lure size. For aggressive bass, a big plug, juicy 9-inch jelly worm, fat grub or large spinnerbait can be great under normal conditions. But sunny skies take the recklessness out of most fish. Scale down lures and baits to match the lighter tackle you’ll be using and the more subtle feeding patterns of sun-baked bigmouths. Most days, I’ll start out in the early morning using my standard offerings for bass, but if the sun begins to shut down the action I’ll switch over to my bright sky offerings. Instead of a big jelly worm, I’ll opt for a 6-inch or 4-inch version. Rather than toss a 5-inch plug, I’ll drop down to a three-inch version, and probably choose one with a slender silhouette. Instead of a large, gaudy spinnerbait big enough to entice a musky, I’ll offer a small one designed to catch crappies. I might even pull out an in-line spinner meant for trout if the sun is shining hard and bright. You know the rule dark colors on dark days, light colors on bright days; keep it mind. Bright day bass definitely favor light color lures. Light greens, whites, pearl and pale yellow all work well. Even better are translucent and clear, see-through offerings. I have, for example, a light green plastic worm that you can see right through. It’s deadly on bigmouths when the sun shines bright. The same color, same transparent appearance, works with small grubs. Instead of using a fat, 4-inch black or purple grub, I’ll scale down to a 2-inch, see-through, light green or silver/gray version. The results have been impressive. Bright sunshine should also push you off the bank in any area that fails to offer obvious shade-creating structure. Move out until you can no longer see the bottom, working water depths of 6 feet or greater. If you have a favorite weed edge or lily edge, work the deep side as opposed to the shoreline side. Look for lilies and weed beds growing in 4 to 6 feet of water to be more productive than those topping out in 3-foot depths. Whenever possible, look for weed beds that border channels and fish the deeper side. Oftentimes, fish will suspend just below the point at which the light diminishes to about 50-percent of surface penetration. If you can see 5 or 6 feet down into the water, then you should be working 7 or 8 feet deep. A good rule of thumb is this: put on a bright white jig and lower it toward the bottom. Note the point at which it disappears from sight and fish 2 or 3 feet deeper. 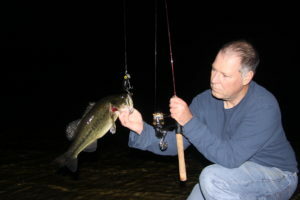 Black Jitterbugs have long bee a favorite weapon of anglers fishing the night shift. Outdoortom.com photo. 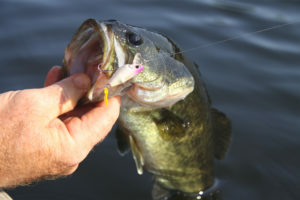 Slowing your retrieve to a crawl in an attempt to finesse fish into biting, rather than trying to aggravate bass into aggressive strikes, also seems to help when the sun puts the on the burn. This is especially true when working soft plastics or tube lures. Instead of trying to cover a lot of ground quickly, anchor up over a deep hole and give it a thorough workout. 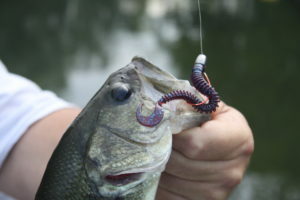 Cast a 4 or 6-inch plastic worm out as far from your boat as possible. Allow it to settle to the bottom, providing just a jiggle or two of the rod tip during the descent. Now, retrieve by simply lifting your rod tip – slowly – from horizontal to an angle of 45-degrees from the surface. Drop the rod tip back to horizontal and reel up a crank or two as the lure settles back toward the bottom. A good cast should take at least 5 minutes to work back to the boat using this method – if you can make it last 7 or 8 minutes, you’ll score even better. Hits are usually subtle, just a sense of a little dead weight at the end of the line. Of course, it’s always a good idea to get out early on your favorite lake if you expect the sun will be a strong limiting factor in your catch rate. Launch at dawn to take full advantage of the one or two-hour window before the sunshine builds in intensity. You can also fish at dusk, keying on the hour or so of sunlight left after the bright yellow orb settles behind the nearest tree line. Lastly, consider making a few nighttime forays for bass. From the fish’s standpoint, the best way to avoid the sun is to feed when it’s not shining. Of course, mosquitoes follow the same edict – so don’t forget the bug spray. Use the LIKE button below to get notifications about new articles in your Facebook news feed! Use the LIKE button below to see notifications for new articles in your Facebook news feed! Sometimes the grass IS greener on the other side. No promos or press releases, just honest reviews that can help you get more for your hard-earned cash. Catch me at the following venues, track down my latest articles, or hire me as a guest speaker or guide.